Destiny First Impressions – To The Moon! Posted on September 15, 2014	by Derek "Gamer Crash"
My travels in Destiny have been well documented with my adventures during the game’s Alpha and Beta stages, but now that the actual retail product is on store shelves, it’s time to see how the core experience holds up. Did it live up to the massive amount of pre-release hype? I began my career as a guardian with the Warlock class. You could say I’m a sucker for abilities that disintegrate a large group of enemies with an orb of purple light. If you’ve played the alpha or beta then the first zone on Earth will be immediately familiar to you. 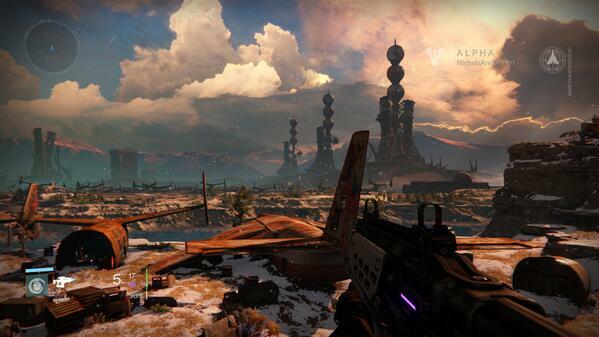 Old Russia and the Cosmodrome. It’s here were you’ll participate in a number of story quests, go on patrols to accomplish various tasks, and gain access to a strike mission. Here on Earth, it plays out pretty much exactly as the beta did except that I’ve been finding a little bit more loot than I did before. If you’re expecting a sort of sci-fi Diablo or Borderlands style game with Destiny, you’re going to be disappointed. Destroying enemies does not make gear and items burst out of their corpses in the same way as those other games. Loot never takes front and center, instead dropping randomly once in a while or finding chests that are scattered across the landscape. Destiny is a pure shooter first and foremost with the other elements like RPG and loot bringing up the rear. You’ll never find yourself overburdened with gear or constantly switching out items for better ones often. Bungie introduces the ability to “sell” gear you don’t want right form your inventory which I honestly believe should be implemented in all RPGs going forward. It’s fantastic. So far, the story has not stuck with me at all which is as equally surprising as it is disappointing. Here you have a game presenting this massive universe which spans throughout the galaxy creating an impressive historical timeline of events that have happened with interesting races and species, and yet, the core game doesn’t really dive into any of the who, what, why, when, and where. I want to know more about this world and what happened, what this evil force known as “The Darkness” is, and so far, I’ve gotten no answers. There’s so much potential here and it’s frustrating that the game doesn’t seem willing to do much with it. In fairness, players earn “Grimoire Cards” for completing challenges (Kill # of X style creatures) or interacting with something for the first time, which are meant to flesh out the history of this world. The problem here is that these cards can only be seen from the Destiny website so from an in-game perspective it doesn’t help. If you want details, you have to do it outside of the game completely. The biggest knock on Destiny is that it’s fairly light on content at this point. Each planet (and the Moon) has only one zone to it, so you’ll be retreading over the same spots quite a bit. Even though the zones are fairly large, you’ll be traversing them quite a bit where tackling story missions or patrolling the zone for quests so you’ll become quite familiar with the landscape. I would have loved to have been able to visit different areas on the particular planet. I mean, Earth’s pretty large so why are we stuck to only Russia? Obviously, this is a pretty easy fix through updates and content additions, but from a launch standpoint, it’s a let down. Even though my thoughts have looked fairly negative up to this point, I actually have been enjoying myself so far. The game absolutely shines when played with others, which leads me to believe that it’s how Bungie wants you to play it. You can certainly play through solo if you want, but the experience kind of drags and becomes overly difficult with the later missions. Playing with others, especially friends, adds a fun dynamic that really makes the game better. The shooting mechanics are fluid and fun which shouldn’t surprise anyone considering Bungie’s pedigree with Halo. Being in control and customizing the character to my play style is a fun treat as well especially in a traditional shooter style game. The Crucible is Bungie’s PvP element and for those of you that have played any of thier previous Halo games, you’ll feel right at home with the big addition being that each player now has their super ability they can use. Matches are balanced so level 5 players can technically keep up with level 20 players, which is nice. Out of the box you’re getting four modes and four maps, which doesn’t feel like a lot but each map can have a weather or time of day variable so the flaw is not as glaring as it could have been. The Crucible is a ton of fun and really manages to be a breath of fresh air for when the single player gets a bit tedious. Destiny strikes me as a game similar to that of Diablo III. For many fans of that franchise, D3 seemed to be a disappointment when it released initially, missing certain features or making weird changes that no one really asked for. There was a solid foundation there but the game as a whole just wasn’t there yet. Cut to a few years later with Loot 2.0 being released and then an excellent expansion with Reaper of Souls, Diablo III has found a new voice and an inspired fan base. That sort of evolution and transition is what I can see happening to Destiny over the coming months and years. There’s absolutely a solid core here, it just seems to come up short in a number of areas which can definitely be corrected over time through updates and DLC. After so much hype leading up to it’s release, it’s disappointing that these things weren’t there from the beginning, but it’s a solid start to what is a very ambitious title. Destiny isn’t the end all/be all of games like the pre-launch hype would have you believe, but it’s a well made shooter with a lot of potential for the future. 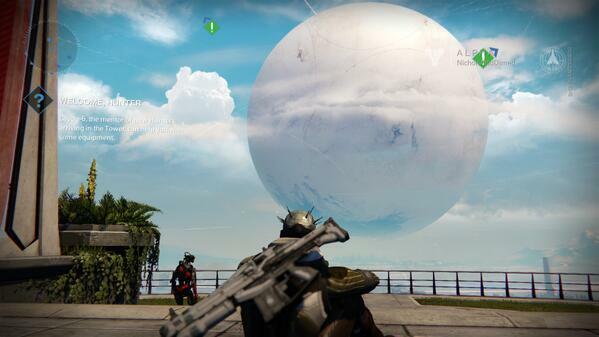 6 Responses to Destiny First Impressions – To The Moon! Leaving the story so bare was definitely a mistake on their part, as were the limited environments. That grand sense of scale they built up wound up falling flat with no information, context, or actual scale to hold it up. I agree that it’s an enjoyable game, but at launch it is definitely not what it we thought it was going to be. Perhaps a year of updates will turn that around. Also, it was a mistake to hide the lore behind collectible cards and a website. Why make us work for what little background information they’ve provided? It doesn’t make sense. Yeah, I’d have to imagine that the majority of players will never bother to look at the cards. Disconnecting the lore from the game like that wasn’t a good idea. If they had managed to add that stuff into the core game and having the cards supplement that would have been a better decision I think. I definitely believe Destiny is just a foundation for the future, so it’ll be interesting to see where the game is 6 months to a year from now. I’m hoping they’ll take more care to draw us into this world with future expansions. Maybe hire a couple of writers who can really make something of the ocean of potential they have here. Completely agree. I want to be absorbed into this universe they created. It’s ripe with potential and features a ton of cool things I want to know more about. Now they just need to execute on that.. Thanks for stopping by, really appreciate it! Yeah, it’s really great to see that Bungie is working hard to improve the game so soon after launch. Shows how much they care for the product. It definitely has flaws, but it’s something that can be corrected over time. That’s part of the problem though, how long are people willing to stand by and wait?